One wouldn’t expect a ballplayer standing 5-foot-8 and weighing 175 pounds to be fleet of foot, but Harry Niles was known as a speedster on the basepaths and a fielder who covered a lot of territory. He also had a couple of famous roommates during his time in baseball – Branch Rickey and Joe McCarthy. Niles was a Michigander and played in the majors from 1906-1910, for four different American League teams: St. Louis, New York, Boston, and Cleveland. He was born on September 10, 1880 in Buchanan, a small city in southwest Michigan, about 13 miles from South Bend, Indiana. Just six miles due east of Buchanan is the larger city of Niles, Michigan. Harry’s given name was Herbert Clyde Niles, the son of George and Sarah (Aiken) Niles. George worked in 1880 at a wagon shop. The couple had five boys and no girls in the family before Harry was born. Two of them – Frank and Albert – were old enough that they were already at work in a factory at the time Harry joined the family. Harry himself started work at a relatively early age. While still 19 at the time of the 1900 United States census, he was married and working as a laborer in a furniture factory in Sturgis. His wife Magdalene was also a Michigan native; both of her parents were German immigrants. Harry’s parents were Ohioans. George Niles was widowed by 1900, living in Buchanan and working as a broom maker. “Hep” Niles was playing for a semipro team in Adrian, Michigan, when he signed his first professional contract in June 1902 with the Toledo Mud Hens.i There is no indication, however, he ever played for Toledo. In December, he signed with Binghamton, and in 1903 Harry became a professional ballplayer. He played two very comparable seasons with Binghamton in the New York State League, 235 games in all, with a combined batting average of .259. He impressed, with Sporting Life saying in June 1904, “Niles, Binghamton's centre fielder, acts like a 2-year-old out of harness. He is on his tip toes all the while, and fields a ball very fast.”ii The Bingoes finished in last place. He was drafted by Connie Mack and the Philadelphia Athletics in September, though Mack was satisfied with his second baseman and there was word that he’d agreed to give Niles to the St. Louis Browns.iv In the 21st century, someone reading such a sentence as follows might be mystified at the seeming altruism: “Manager Mack turned Niles over to the St. Louis Club because he considered him too good to be relegated to any minor league and yet not quite good enough to replace Danny Murphy.”v Mack surely got something out of the deal, though it’s also worth remembering that these were the early years of the American League, and things that improved league play overall benefited those such as Mack who had a financial stake in the league. On the ball field, he’d gone hitless in his first game, batting seventh on April 24, but hit two singles and drove in a run in the next day’s game. By season’s end he had hit .229 in 541 at-bats, with 71 runs scored and 31 batted in, walking 46 times for a .297 on-base percentage. The Browns finished in fifth place, 76-73, under manager Jimmy McAleer. 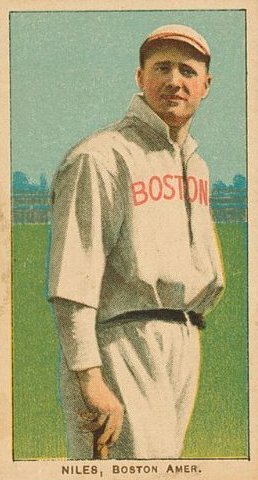 He hit two home runs, the first off Washington’s Tom Hughes and the second off Boston’s Cy Young. Taking advantage of his speed, he stole 30 bases. Both the runs scored and stolen base total proved to be career bests. It was in 1906 he had roomed with Branch Rickey. After the last games of 1906, Niles stayed in the city and took an offseason position with the St. Louis Water Department. Niles hit .249 in 95 games for New York, and briefly attracted the moniker “Home Run Harry” after hitting a homer in back-to-back games on May 18 and 19. His five homers in 1908 more than doubled any other year in his career. Working a base on balls to lead off the June 30 game against Boston, he was the last New Yorker Cy Young let reach base. Young no-hit New York for the Red Sox, with only Niles’ walk standing in the way of a perfect game – and Niles was caught attempting a steal of second base; Young faced only 27 batters without yielding a base hit. In 1910, John I. Taylor had seen one of baseball’s best outfields come together in three 22-year-olds: Tris Speaker, Duffy Lewis, and Harry Hooper, who had taken over at a point early in the season when Niles was ill. Niles had become superfluous. He had also apparently hurt his arm during spring training at Hot Springs. The Cleveland Naps needed an upgrade in hitting and in speed on the basepaths, so in May, Cleveland offered Red Sox owner Taylor enough money to purchase Niles outright from Boston. The $4,000 deal was done on May 27.xii He’d been hitting .211 for the Red Sox in 18 games, but Cleveland writer Ed Bang opined, “Perhaps Niles will be the Moses to guide them out of the wilderness.”xiii Niles didn’t do appreciably better with Cleveland (.213) than he had for Boston, though he played in 70 games – his last in the major leagues. Cleveland had three pretty good outfielders booked for 1911: Joe Jackson, Jack Graney, and Ted Easterly. They, too, found Niles superfluous and sold his contract to the Toledo Mud Hens in early January. He worked the next two seasons for Toledo, though he took several weeks and some convincing before he agreed to terms with the Mud Hens on February 25. It was in 1911 that Niles roomed with Joe McCarthy, both of them playing on the Toledo team. Niles hit .277 and McCarthy .268. In 1912, Harry put together a hitting streak which reached at least 25 games and was above .300 until the last few days of August. He finished the season at .294, second on the team only to Ray Chapman. In February 1913, he was sold to Indianapolis by a Toledo team that felt he was at the height of his value, while they had some younger players coming up. Indianapolis finished dead last. Niles hit .259. In 1914, the Indianapolis team finished third – but by May had traded Niles to St. Paul, which finished last. He had a good year personally, hitting a combined .300 average for the two teams. In 1915, it was all St. Paul, which leapt from the American Association basement to finishing just a game and a half out of first place. Niles hit at a .279 pace, with a career-best six home runs. His last year was 1916, and in February, he was on a list of players expelled from the Baseball Players Fraternity for non-payment of dues. He began the year with St. Paul, but on August 10 his contract was purchased by Kansas City. That’s where he played his final games in baseball. In January, the team gave him his unconditional release. Then 35 years old, he said he might have a couple of more years of baseball left in him, but he was offered a fulltime job and took up work as a policeman in Hibbing, Minnesota. Though he and his wife Magdalena had two children – a daughter Frances (or Leslie) and a son Harry – he enlisted in the United States Army. Private Niles rose in the ranks of the Army, reaching first lieutenant before departing. His obituary in The Sporting News says he “turned to semipro ball as a manager, promoter, and player, first in Minnesota and then in Flint, Michigan. His last experience as a player was in 1929 on a barnstorming tour with Babe Ruth.” The United States census has his working in Flint as a mechanic in an automobile factory in 1930 and as a factory worker in a brass foundry back in Sturgis in 1940. Harry and Lena had married before he began his baseball career, in 1901, and in February 1951 celebrated their 50th anniversary. A little more than two years later, he suffered a cerebral thrombosis in April 1953 and died on April 18, survived by his wife and their two children. In addition to the sources noted in this biography, the author also accessed Niles’ player file from the National Baseball Hall of Fame, the Encyclopedia of Minor League Baseball, Retrosheet.org, and Baseball-Reference.com. i Sporting Life, July 12, 1902.
ii Sporting Life, June 4, 1904.
iii Sporting Life, October 7, 1905.
iv Sporting Life, December 9 and 16, 1905.
v Sporting Life, February 24, 1906.
vi As quoted in Sporting Life, October 13, 1906.
vii Washington Post, July 24, 1906.
viii Sporting Life, August 3, 1907.
ix Eaton was writing in Sporting Life, issue of November 16, 1907.
xSporting Life, September 12, 1908.
xi Hartford Courant, February 5, 1917. See the correction in The Sporting News, April 29, 1953.
xii The sum was reported in the January 4, 1911 New York Times. xiii Sporting Life, June 4, 1910.
xiv Baseball Magazine, January 1914.
xv Boston Globe, May 28, 1910.